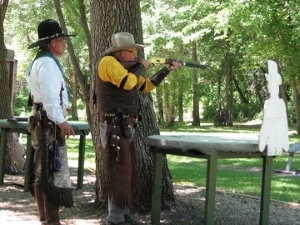 Cowboy Action Shooting (CAS) is the fastest growing outdoor shooting sport in the country. Whether you're male or female, young or old, if you like anything that has to do with the Old West, Cowboy Action Shooting just might be the thing for you. 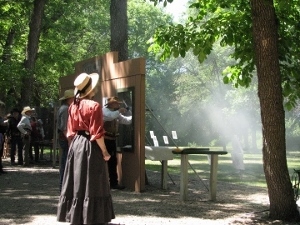 It's a sport where individuals shoot at steel targets with live ammunition using firearms that are originals or reproductions of those available between the Civil War and 1899. Props, stages, aliases and period clothing help create an aura of the American West of over 100 years ago. Matches are scored based upon elapsed shooting time plus penalty points for missed targets. SAFETY comes first. Each match begins with a mandatory safety briefing. Guns are loaded and unloaded under the watchful eye of a safety officer and eye and ear protection are required for all shooters and spectators. The Sheyenne Valley Peacekeepers is one of four SASS affiliated Cowboy Action Shooting Clubs in North Dakota. For more information about SASS (the Single Action Shooting Society) go to www.sassnet.com. There you will find more detailed information about how the game is played as well as links to all SASS-affiliated clubs. Regular monthly matches are held at our range southwest of Enderlin, ND, usually on the last Saturday of the month (events schedule). Match registration starts at 11:00 am. The mandatory safety briefing begins at 11:45 with the main match beginning at 12:00 noon. Spectators are always welcome. Reminder: Before packing up your gear and taking off to a monthly match, please check our website or club contact to confirm the date and starting time. Safety briefings are mandatory, so be sure to allow enough travel time to the range. In June, we'll once again host the combined North Dakota and South Dakota SASS State Championship, Peace in the Valley. Our range (see an aerial view) features ample parking, a shaded and graveled shooting line, props, targets in various shapes and sizes, and areas for camping during two-day shoots. Please review our camping rules. Read about how our range got its start! Yearly memberships are available for $20.00 for an individual and $30.00 per family. Each spring, we host a free New Shooter Seminar for anyone interested in finding out more about Cowboy Action Shooting. We'll explain how the game is played and show what equipment is used. After two hours of class time, weather permitting, attendees have the opportunity to run through a practice stage using our guns and ammo. This year's seminar will be held April 28th at 9:00 a.m. If you're interested in this free seminar, please register by calling Wild River Rose at 701-793-4116 or e-mail svpcas@gmail.com. Additional information will be sent to you when you register. 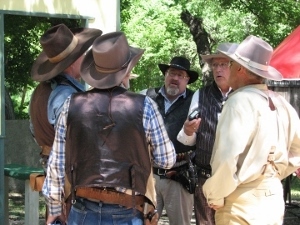 Cowboy shooters never get tired of welcoming new shooting friends or talking about Cowboy Action Shooting. 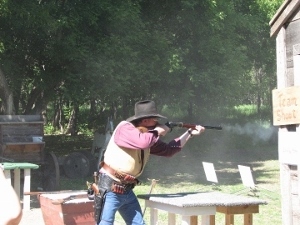 If you would like more information about the sport, the Sheyenne Valley Peacekeepers, or to register for the free New Shooter Seminar, give Wild River Rose a call at 701-793-4116 or e-mail svpcas@gmail.com and discover the fun of Cowboy Action Shooting!